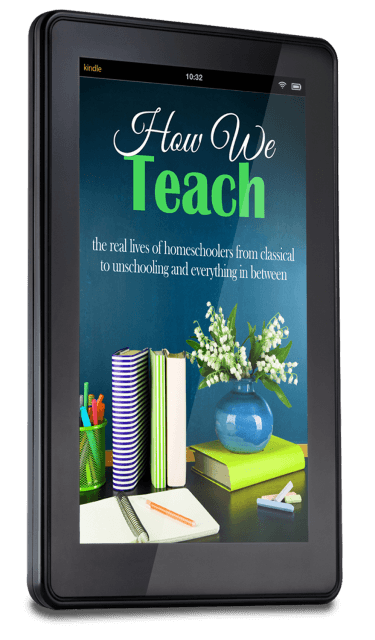 Whether you are a homeschoooling newbie looking for ideas on how to teach your own children or a homeschooling veteran looking for affirmation, there is something for nearly every method and school-age in this 200+ page ebook. Truth be told, homeschooling is really a very individualized educational path. Some prefer to stick to the Three R’s in the early years. Others prefer to expose their children to anything they can get their hands on. Some teach their children from a Classical perspective. Others think unschooling is the way to go. There really is no wrong way to go about it as long as it is the right way for you and your child(ren). And THAT is why I really like the way this book is organized. Now you can read insights from 25 homeschooling veterans who provide tips for everything from reading to math, from Charlotte Mason learning to Montessori environments. It’s all here in the NEW book, How We Teach: The Real Lives of Homeschoolers from Classical to Unschooling and Everything in Between.